A month after the Nov. 2 shooting, survivor Kate Pierson shares her perspective of that night and her life after tragedy. So I find myself wide-awake in another night of darkness. Desperate for sleep and peace, I sit here, thinking about how I used to look forward to going to bed. Now I can hardly bear it. I turn off the lights, and the anxiety switches on. I observe the silence and await the violence: anticipation of gunshots, screams and terrible dreams after the nightmare of Nov. 2. It won’t go away. Neither will the questions, the fear, the trauma, the depression. This is my new nighttime. Even as I celebrate life, hugs and happiness more than I ever did, this is my new normal. I left my office at Rowland Publishing early that Friday. I wanted to make sure that I got to Hot Yoga Tallahassee in plenty of time to open up the studio and get it ready for another dedicated class. I work part-time on the front desk — that is, when I’m not practicing yoga as a student there. I wasn’t supposed to work that night but agreed to cover for a colleague who needed the night off. That disappointed me a little, I admit, because I felt I had established a bond with that night’s teacher, a kind soul, and I wouldn’t be able to take her class. At least I got to be at the place that I considered another home, a refuge of peace for me for the last year. I powered up the waterfall, turned on the essential oil diffuser, checked the attendance list and cleaned the hot room. The teacher came in about a half-hour before the start of the 5:30 p.m. class. We chatted briefly before she went into the hot room to decompress from the week and to get ready for her session. Shortly afterward, a man walked in and said he wanted to sign up for the 5:30 class. He said his name was Scott Paul, and he paid the $12 fee with his visa debt card. I told him where he could find the cubbies, bathroom and water fountain. I invited him to go into the hot room. He asked me if he was early. It was 5:17 p.m. I know that because when he asked, I looked at the clock on the computer. I told him that despite the nearly empty hot room, it wasn’t too early to go inside. I pointed out that on Friday nights, a lot of folks come in right at 5:30 because they have to rush here from work. I encouraged him again to go inside, but he said he wanted to get some fresh air. I said no problem and told him he was welcome in the hot room when he was ready. He stood out as tall, large and imposing. I also found him somewhat pleasant. He seemed flustered, but I didn’t see that as odd. I’ve found that it’s not unusual for men trying yoga for the first time to be nervous and restless. Even before my first hot class, I waited outside the room until the beginning of class because I was nervous about the temperature. To promote flexibility and strength, the room is kept at 95-102 degrees. A few students checked in, then the man came back inside. He asked me how many students would be in the class. I said 8. He said that didn’t seem like a lot. He asked me which weekend classes were busiest — a common question among new students. I said Saturday mornings have a lot of people and that the number tends to decrease through the day. He said he found it interesting that the earlier classes would have more people. I chuckled and said yes but that some folks like to start their weekend day with yoga and keep the rest of the day open. He nodded and walked outside again. More students arrived. At 5:30, the teacher came out of the hot room and asked me how many people she had. I said she now had 10, including a man pacing outside. She told me she needed to get started and to send him in when he was ready. About four minutes after class started, he came back in. He walked right past me into the hot room. I heard some talking. He stepped back outside the room, which was to my back. I figured the teacher had asked him to take off his shoes and socks and to put his personal belongings outside the room. I heard him fumbling with something, but I didn’t turn around to see with what, perhaps the plastic wrapping on the new yoga mat he had been carrying. He went back into the room, and it wasn’t a minute later when I heard three bangs on the wall behind me. Then came the gunshots. I heard five, fewer than actually fired. Maybe that was because time froze the moment I understood the situation: Somebody in our yoga studio was shooting people. I got up and ran. I ran out the door and under the awning of the second floor of the Betton Place plaza. I heard screaming behind me. I turned and saw one of the yoga students following me, running. I waited. She caught up and told me she thought she was shot. I saw a bullet hole in the back of her yoga pants, but I saw no blood, and we kept running. We ran downstairs into Food Glorious Food and asked for help. There I sat for the rest of the night, in the back room of this bar. I wondered and prayed. I wondered about everybody’s safety. I wondered why I didn’t grab my phone before I ran, because now I wanted to speed-dial the studio owner. I wondered if I had let everyone down because I ran. I prayed that my friend, the yoga instructor, was still alive. She was. I finally got to see her hours later, and we spent much of the evening at the police station giving authorities our stories. She told me that she was the one who’d banged three times on the wall. She’d tried to warn me of trouble. She prefers to keep her name and her story out of the news, and I don’t feel it’s my place to share what happened inside that room. I’ll instead share the moment that continues to play inside my head. Before he started firing inside the hot room, Scott could have shot me from behind. You notice that I call him Scott, not “the shooter.” Here’s why: That’s how I know him. He introduced himself as Scott Paul, even though he would be identified as Scott Paul Beierle. When I call him Scott, I remove any fear of him and prevent him from having that power over me. When I call him Scott, I don’t grant him the martyr’s death that he wanted. Before killing himself, Scott shot and killed Florida State University student Maura Binkley, 21, and Nancy Van Vessem, 61, an FSU faculty member. He shot and wounded four other women and pistol-whipped a male yoga student who tried to stop him. News reports strongly suggested that Scott had targeted women, and only God knows why he didn’t shoot me. My mind has been replaying this, with different endings. What if he had shot me? What if he hadn’t posed as a curious yoga student and just barged in and started shooting? Would I be alive to share this? I’m grateful to be able to do so. But I am scared. I am traumatized. And I am changed. Before Nov. 2, I was always cautious but adventuresome and optimistic, with eagerness to experience the world around me. Now I cry on and off for days. I fear nightmares and being alone, and I get zero sleep. I get anxious at work and have to leave. I see a counselor regularly. A friend told me that I am just as safe right now as I was before this happened. I understand his point. But Nov. 2 changed everything for me. I don’t share my story to tout gun control or to debate the 2nd Amendment. Certainly, we can’t go on this way as a society, and we must find solutions to this epidemic. For me, maybe that’s a commentary for another day. I share this to illustrate the way in which a violent, traumatic event affects a human being’s body, mind and soul. As I write, I’m full of fear, depression and dread. I lack motivation and don’t want to go to work. I just want peace and sleep. I feel helpless as my mind shows me a million violent things that could end my life tonight. I have pepper spray by my bedside, but it hardly reassures me. I talk to my mom on the phone, and I tell her how I’m feeling. I start to look up things for my Amazon wishlist: a stun gun, a pocketknife disguised as a key, a pink gun accessories kit; conceal carry holders, and a baseball bat. I realize this isn’t me. Or maybe it’s the new me. I’d always stayed aware and paid attention to my surroundings. But I’d never spent hours researching a Taser that has a 15-foot shooter radius. It is $311, and I’m probably going to buy it. My anxiety is wearing on my body, particularly from tenseness and pain in my neck, shoulders and back. A deep tissue massage and a chiropractor have helped. Yet sometimes I randomly shiver or start shaking. Other times, I feel tightness in my chest that makes me want to curl up in a ball and sleep. I’ve done my best to remain strong and to get on with my life. 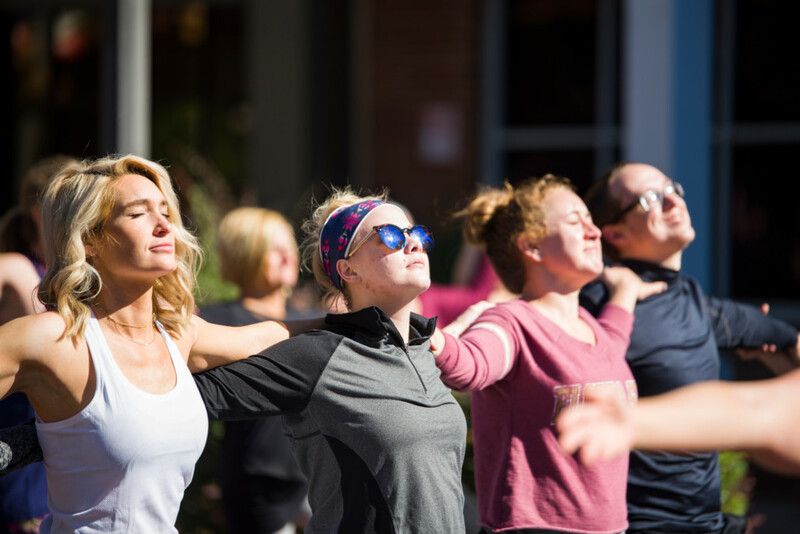 The morning after the shooting, I joined others, including colleagues, in a downtown yoga event in a symbolic effort for those affected by the shooting. A week after the shooting, I followed through with plans to visit Disney World with my younger sister. On the shuttle bus, I watched each person board, and in each case, I wondered about the likelihood that he or she had a weapon. I made it a point to find the emergency exits on each ride and in each building and area of the park. I could not handle the fireworks show and almost cried listening to the popping behind me. All of this probably will be another new normal for me. Yet I still find happiness and beauty and still another new normal: a yearning to connect with people. I want to spend time with the people I see every day, and I want to make meaningful relationships a priority. I think the most beautiful thing about life is our ability to create our own realities. Yes, this violent and traumatic event happened. Yes, it will probably be a while before I get back on my yoga mat at an indoor studio. Yes, I have months of therapy and anniversaries ahead. But despite the trauma, the fear, the anxiety and the lack of sleep, I allow happiness and moments of normalcy. I spent Thanksgiving with my family. I didn’t think about the shooting, and I didn’t feel bad about not thinking about it, including the lives that it claimed. I choose these moments of happiness. Nobody can take those away. As I continue to document my new normal, it will be with healing. And it will be with gratitude, gentleness and love. In addition to her part-time role at Hot Yoga Tallahassee, Kate Pierson works as marketing manager at Rowland Publishing, owner of Tallahassee Magazine.